We just welcomed the newest member of the family, Luce (pronounced Lou-chay), who came to use from Salt Lake City via Delta Airlines. His full name is "Raycevision's Ecco Luce il Cane Bellissimo". We are trying something new to update everyone with information about Luce. Visit our Berner Blog: costello.mine.nu/blog regularly to check for updates. 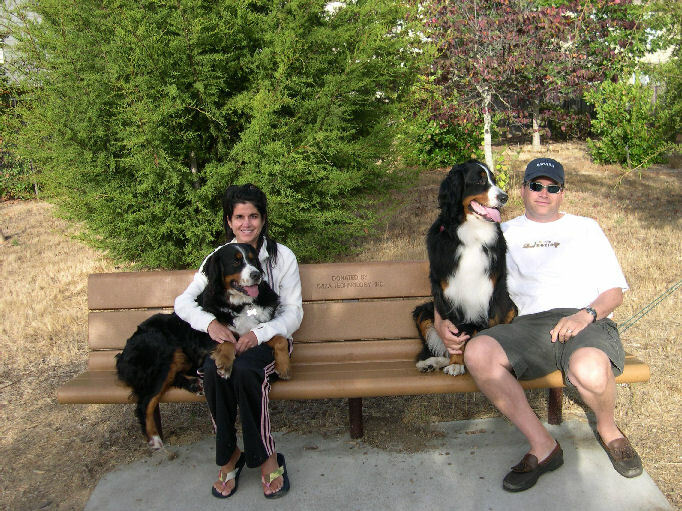 Here is a picture of Ruby and Coco relaxing with us on a park bench. Why be on the ground when you can be comfortable. 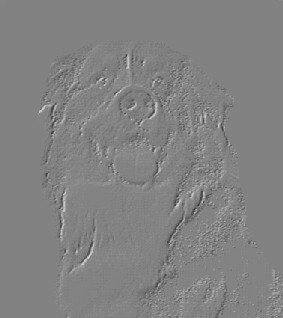 Ruby came to use from a Southern California Berner Rescue. She was found as a stray when she was placed in a foster home before we adopted her. 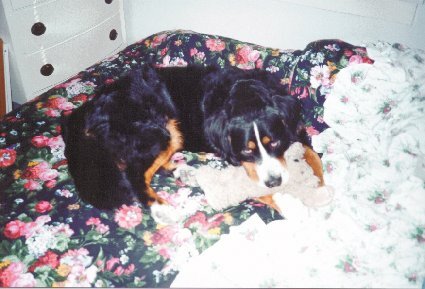 Coco came to us from The Heart of Michigan Berner Rescue which is where Nico was from. After we lost Nico to DM we were in contact with Bruce and he told us about a young girl named Maddie that seemed perfect for us. Unfortunately, she got very sick and Bruce did not think she was going to make it. We then found out about Ruby and made arrangements to pick her up near Santa Barbara. Just before we picked up Ruby, Bruce called to let us know that Maddie had made a miraculous recovery so we decided to adopt both of them. Of course we decided to change Maddie's name to Coco which seemed much more fitting. We lost Ruby in 2015 due to what our vet thinks was organ failure. We just recently lost Coco when she lost her fight with Lymphosarcoma. She fought hard for 3 months after she was diagnosed and when through several courses of chemo. She was such an amazing dog. She just wanted to be wherever we were and could not get enough attention. Above is a picture of Nico. 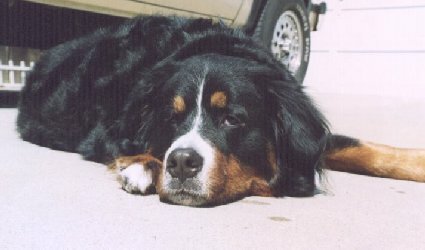 He was rescued from a puppy mill in Michigan by The Heart of Michigan Bernese Mountain Dog Club rescue. When he was saved he weighed 46lbs and was heart worm positive. Obviously, he was in really bad shape. The rescue tried to place him locally but could not find a suitable home. On August 7 of 2006 Nico made his was from Detroit to San Francisco to be ours forever. Nico was formerly known as Sammy but he never acknowledged that name which is partly why we gave him a new name. Click Here read more about him and see some pictures. 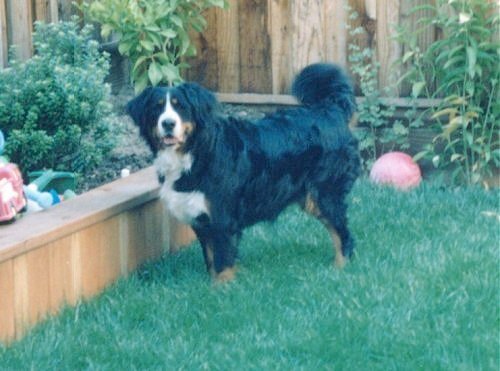 Our last berner we got as a pup from Sugarpine Kennels and his official name was Bruno von Barron Gold. We just caled him Bruno. 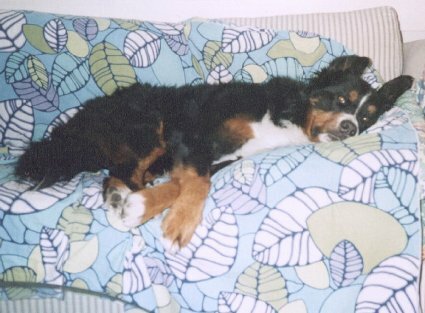 He was about 120 pounds but always a puppy at heart. Click here to go to Bruno's page. 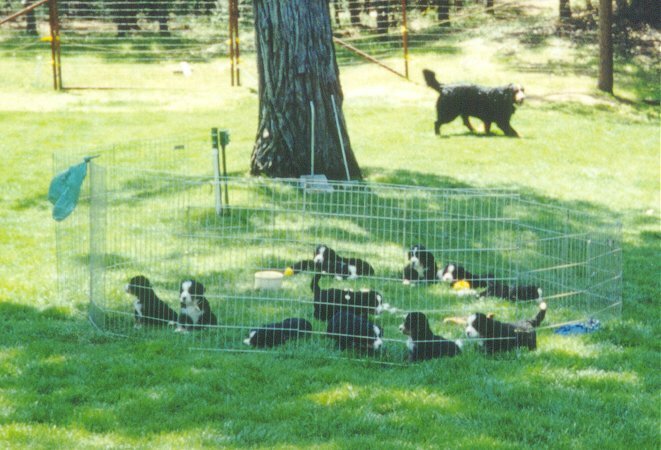 You can see The whole litter here as well. Before Bruno we got Sasha in a sort of rescue situation. Now that we have seen what a "real" rescue is, she was more of a re-home from a backyard dog situation. She was returned to her breeder after a year and a half and we got her soon after that. She always had a few issues like eating anything cloth. Her favorite was socks and underwear but carpet fringe and bed dust ruffles would work in a pinch. Here. are a few pictures of Sasha and Bruno in the Navigator. 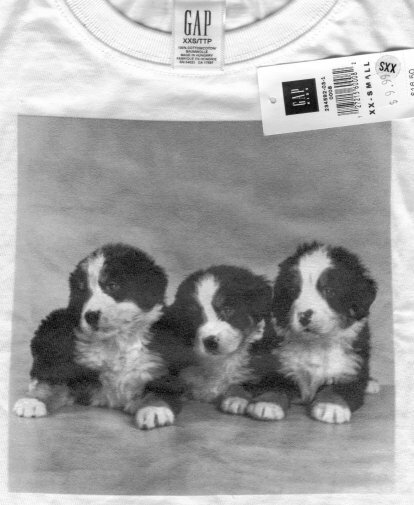 Here is the pic of the Berner Pup "T" shirt from Gap Kids. Sasha was a real sweety and couldn't get enough attention. 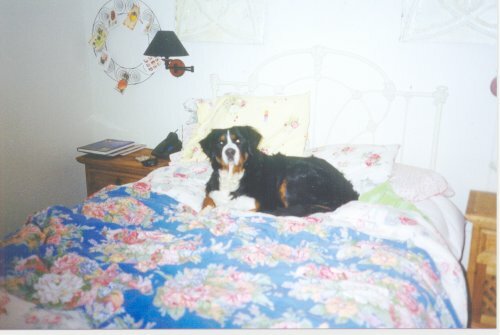 She liked to lay on the bed and chew her baby when we were not around. She was a big time food stealer. She went after anything that wouldn't be dog food otherwise. We lost Sasha due to a severe back injury that could not be corrected with medication or surgery. We miss her dearly. She especially likes to gently remove food from our son's unsuspecting hand. On the down side, she tends to stick her nose into your crotch whenver given the chance. This is a picture of Sasha hanging out in the backyard. 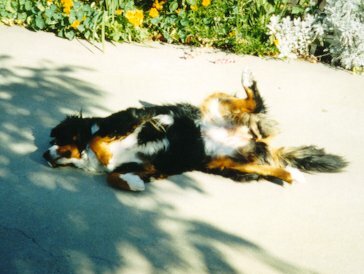 Sometimes Sasha was not really much of a lady! or like here. The funny thing about this picture is where she is laying. We tried to get her to lay on the (blue) cover sheet to help keep the fur down to a minimum. However she prefered to lay on the comforter or pillows which are softer. Occasionally she will burrow down under the comforter and nestle in for a nap. 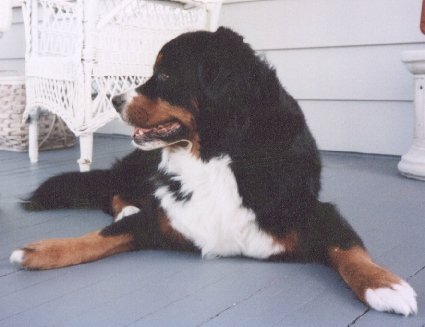 Our first Berner was Sophie and she was a beautiful Bernese Mountain Dog. 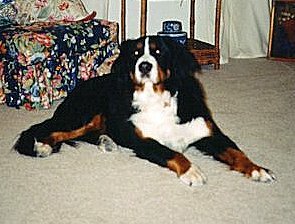 "Berners" as they are known, if you are not familiar with this amazing breed, are gentle companions that are dedicated to their family. Sophie loved to be with her family, in the car, in the house, at work and at play (She loved to come to work with me). Wherever we were, she wanted to be. She was only with us for a few short years but she will remain in our hearts forever. 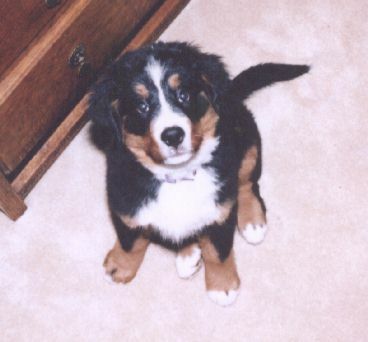 Here are some pictures of Sophie: Start with a puppy picture of Sophie. She is trying to give a look as if to say "What puddle?". Try Sophie on the porch. This picture was taken while I was trying to get a front shot, but as just before she looked away. I think the profile is great. It still amazes me she can get comfortable even while laying on the driveway. And then there is one of our favorites: Sophie waking up in the morning. Last is Sophie at my work. 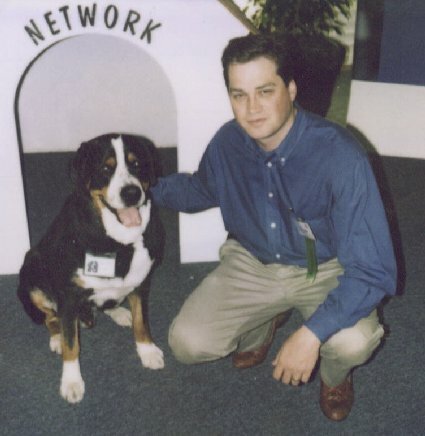 On a somewhat related topic of Swiss Tri-colored Dogs, I have a picture of a sweet Swissy: Network the Dog (and me) which was taken at SUN's Ultra Computing introduction held on November 7, 1995. Notice that he actually has a SUN ID badge, I thought it was really cool. For more general information about these great dogs. 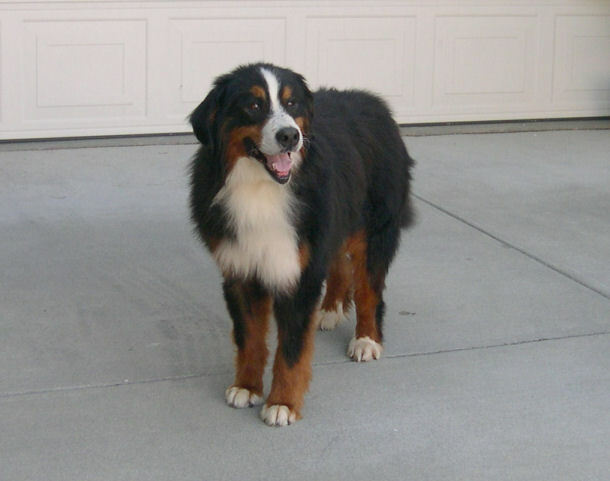 You may also want to check out the Bernese Mountain Club of America's Home Page. 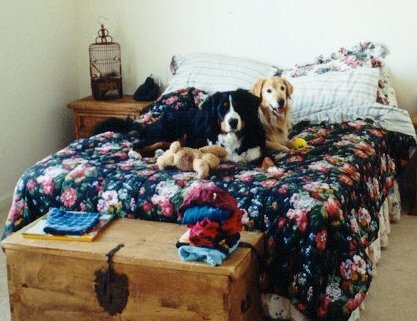 For more information about berners, I would highly recommend reading The Beautiful Bernese Mountain Dogs , Russ and Rodgers, Loveland, CO, 1993. We had our's autographed by Dianne Russ at the 1996 Specialty. If you have any questions/suggestions, you can email me here at costellob@asme.org.